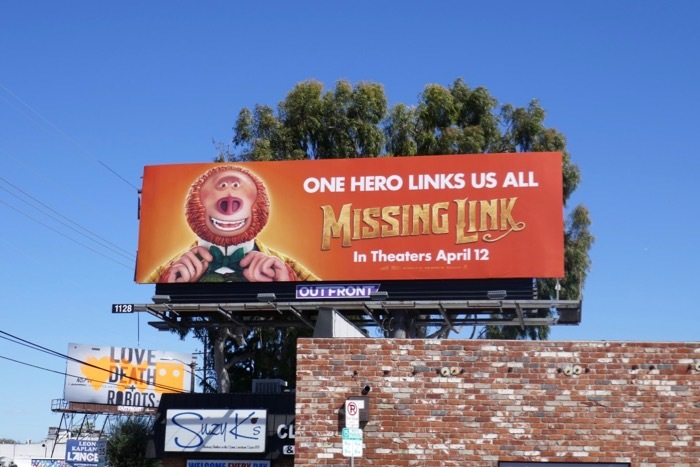 Daily Billboard always loves to start the week with something special and this time that enigmatic Missing Link is provided by the new film from Laika. 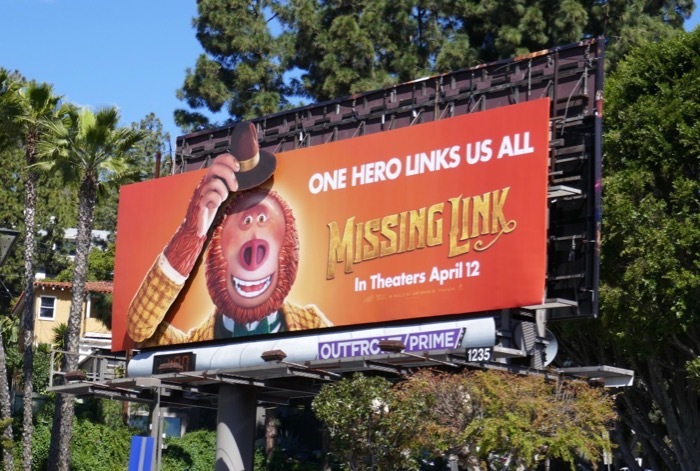 In addition to all the standard and special extension cut-out billboards around town, there's also this motorised moving billboard doffing one's hat along West Hollywood's busy Sunset Strip for the new stop-motion animated comedy. 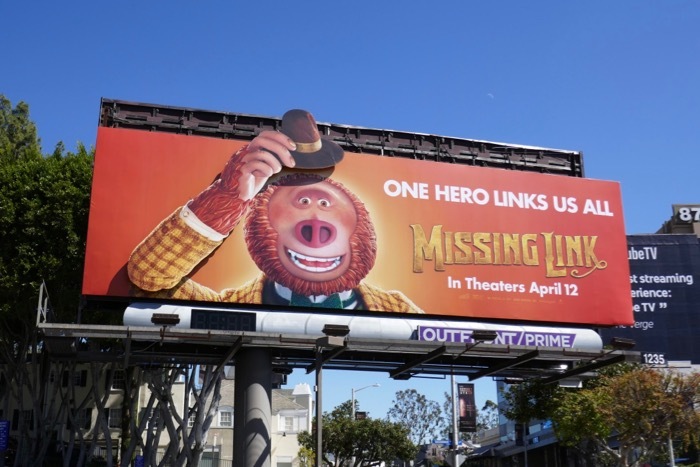 In the film a myths and monster explorer, 'Sir Lionel Frost' (voiced by Hugh Jackman), embarks on an adventure to discover the legendary Bigfoot creature, 'Mr. 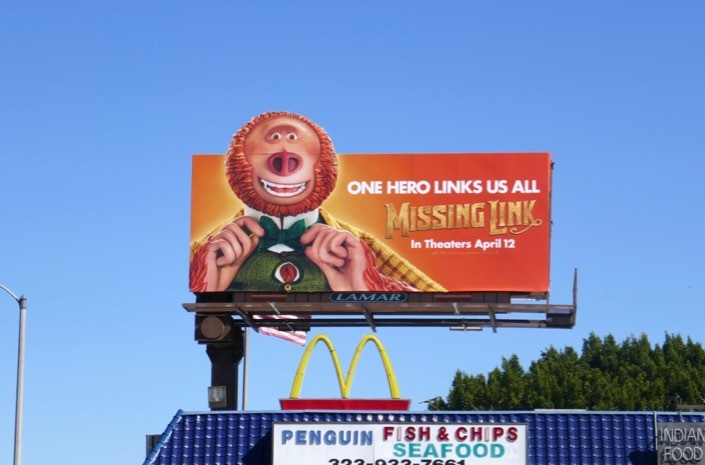 Link' (Zach Galifianakis). This fifth feature from the Oregon-based stop-motion studio the odd duo team-up with another adventurer, 'Adelina Fortnight' (voiced by Zoe Saldana), on their quest from the Pacific Northwest to the fabled Shangri-La. 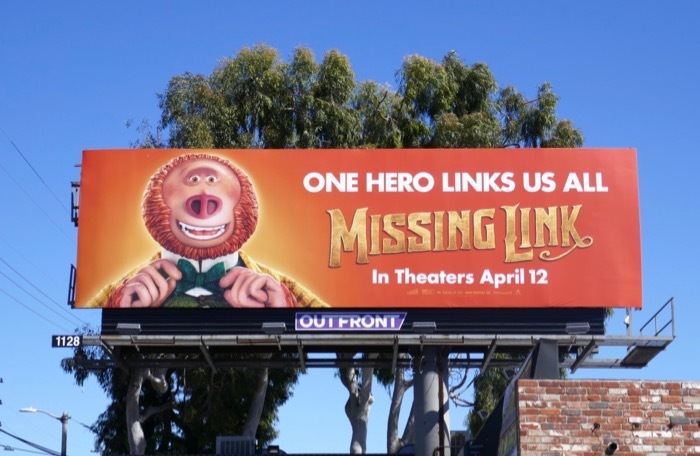 The fun animated movie directed by Chris Butler also features the voice talents of Emma Thompson, Stephen Fry, Timothy Olyphant, Matt Lucas, David Walliams and more besides. 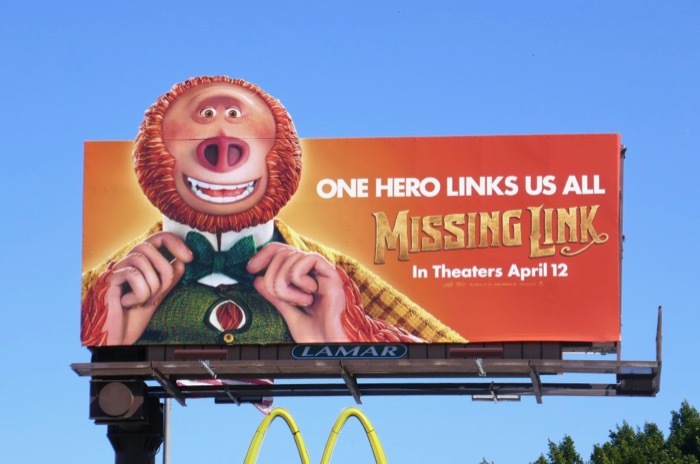 Yetis seem to be all the rage at the moment, as it was only last September that the computer-animated Smallfoot movie also graced the big screen. 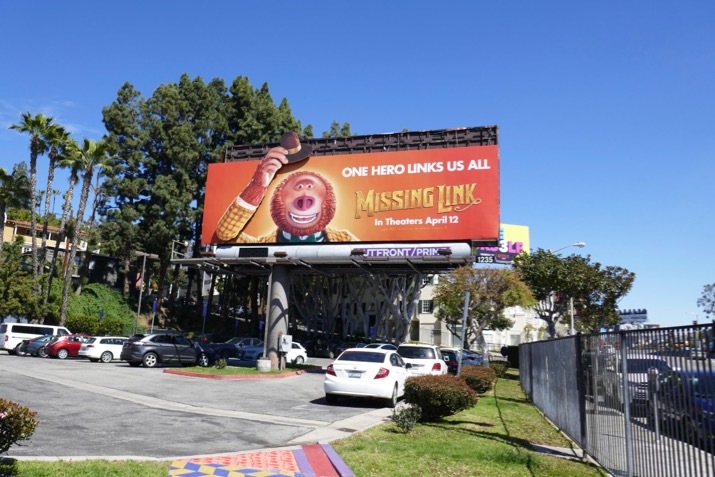 This jovial moving movie billboard, created with help of Atomic Props & Effects, was captured entertaining passersby along the Sunset Strip on March 12, 2019. 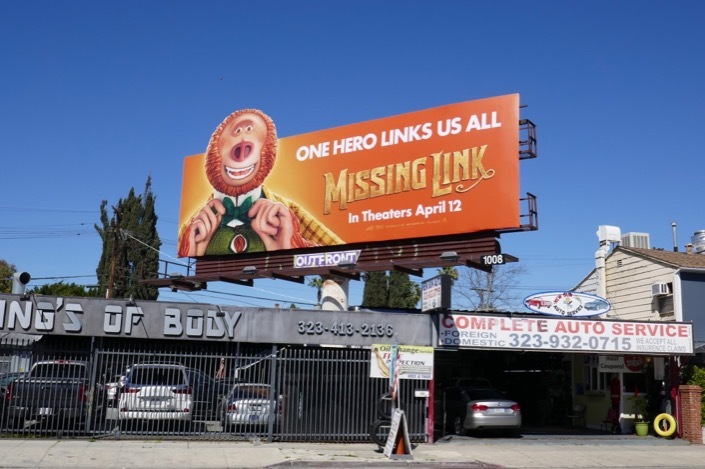 Meanwhile these other vibrant billboards were spotted along Melrose Avenue, 3rd Street and Pico Boulevard on March 13, 2019. 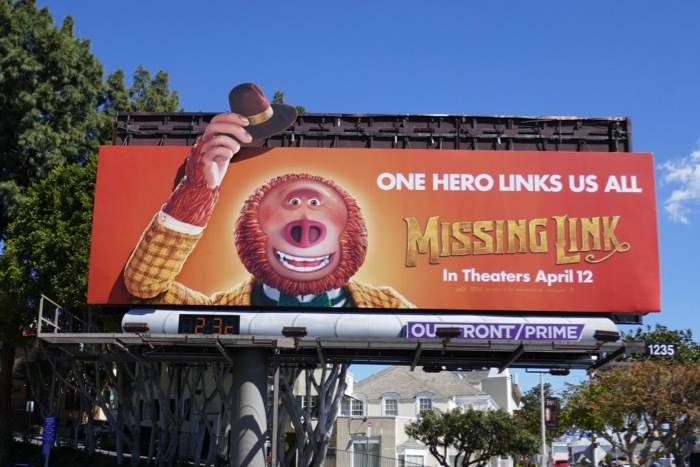 Fans of Laika Studios can also enjoy these Kubo and the Two Strings film billboards, these movie billboards for The Boxtrolls and these ParaNorman movie billboards. 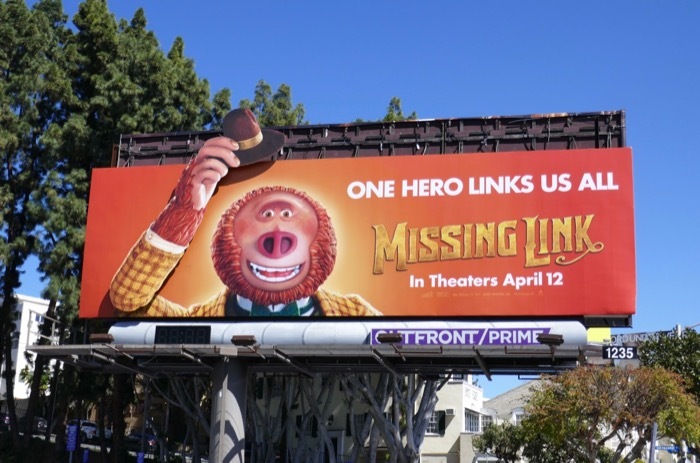 Meanwhile for more eye-catching moving billboards making a spectacle in the city skyline, make sure you additionally take a look at this Disjointed billboard and this Inherent Vice movie billboard. 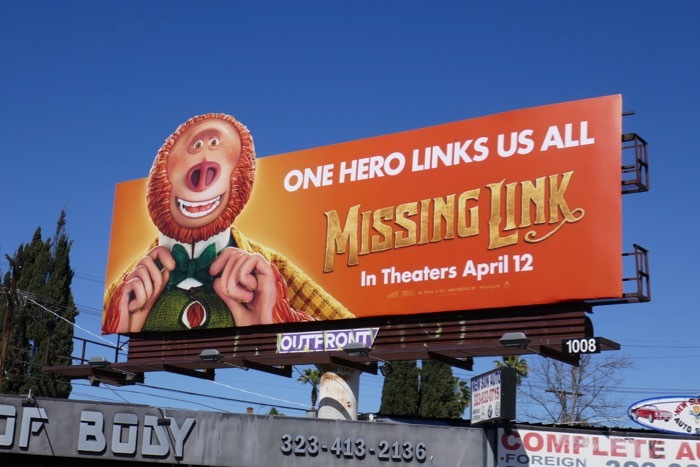 Only time will tell whether the Missing Link will be a mainstream hit for the animation studio and maybe even win a coveted Best Animated Feature Oscar.